Kikori is a Toast to the Zen Life. Launched in the fall of 2015, Kikori is an up and comer in the Japanese Whisky scene. This new release is owned by Ann Soh Woods of Soh Spirits based out of L.A. Ann is making quite a splash about town, with her 100% rice based Japanese Whiskey, which she chose to spell with an “e,” to distinguish Kikori from other Japanese Whiskies. And rightly so because it's the first of its kind…even the Alcohol and Tobacco Tax Bureau didn’t know what to do with it, and where completely unaware of how to classify it at first. It is similar to Shochu -a Japanese Alcohol distilled from rice or sweet potatoes- but is served at a higher 41% ABV than Shochu's 25-35%. Woods is pushing the boundaries of Whisk(e)y, thinking outside the box, and not only is she reinventing Japanese Whisky, she's making good product too. Kikori had barely been on the market for a year and it snagged a gold at the 2016 San Francisco World Spirits Competition. Needless to say Kikori is killin' the game, and then bringin' it back to life as a waking Japanese dream dram. And not to get all PC bro, but Whiskey is a pretty male dominated industry, “It is always assumed that I am a sales representative when I visit accounts, and it is always a pleasant surprise when they find out I am the founder.” Said Woods in an interview with Munchies Magazine. Kikori is distilled in Kumamoto on the island of Kyushu, Japan, the birthplace of Kikori, where the unconventional Whiskey has gained popularity as well. The rice is sourced locally from the Kumamoto rice paddy, with a volcanic rich soil that makes the rice unique. The signature rice is cooked in giant steel steamers, and distilled using pure mountain waters that flow through ancient volcanic rocks millions of years old. So enough talk, how does it taste? The rice gives it a unique aromatic profile with a floral and fragrant aroma, and a velvety smoothness to the palate. It is aged for over 3 years in American Oak, French Limousin oak and Sherry casks. What does Kikori Whiskey taste like? The Flavor Spiral™ shows the most common flavors that you'll taste in Kikori Whiskey and gives you a chance to have a taste of it before actually tasting it. I gotta rate this mid tier, more sake than whiskey but still a nice drink but probably better in a cocktail, whereas others like Takeuchi have a much better overall flavour profile. Light and very approachable. Flavorful but elegant. Kikori has a light nd sweet initial feel followed by a briefly smokey feel and a nice whiskey finish, a great addition to any bourbon bar to break from the standard whiskey outlook. Kikori is a fine whiskey! Light and rich at the same time (hard to imagine) this is a great drink to sip and savor slowly. It should not be mixed with anything...not even soda or ice. Lightness of taste includes a smokey and carmely quality that coats your tongue with flavor, Great Japanese whiskey. Very strong alcohol smell. Sweet at first, fruity at the end. Not something I'd drink as is because of the burn going down, which I feel takes away. I'd recommend a chaser if anyone is looking for smoothness going down. But it does taste good. Got a little smokey aftertaste. For a rice whisky this is amazing. It’s light and big on taste. You say this is a whiskey but it is like a Sake! Which isn't bad just wasn't expecting this when I ordered it! Light and crisp with very little mouthfeel but a bit of burn in the back. It does have a beer note similar to bud light. I typically like my drinks more robust where with kikori i feel like im trying too hard to taste anything other than the initial taste. A very smooth and uniquely consistent taste from first sip to swallow. Light and mellow. Not what I was expecting but came to appreciate. Very much enjoyed the clean taste. Enjoyed the fresh, light taste that comes from its rice base. Blah, awful, horrible, completely lacks character. Can't wait to find someone, anyone honestly that likes it so I can pass it along. Awful. Taste before you buy. That's where I screwed up. It was an extraordinary special whiskey with notes of saki due to the source of rice, but wonderful on the palate. Not whiskey, SHOCHU - very good shochu. 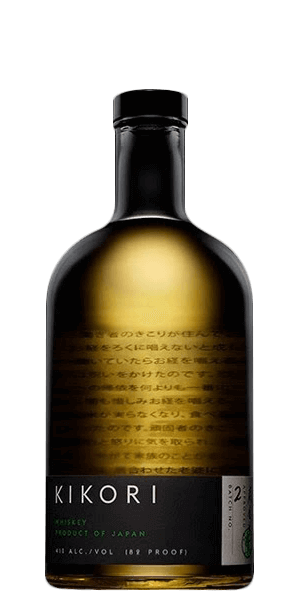 Taste grainy and earthy, smoother slightly warmed like sake, takes away the medicinal taste.